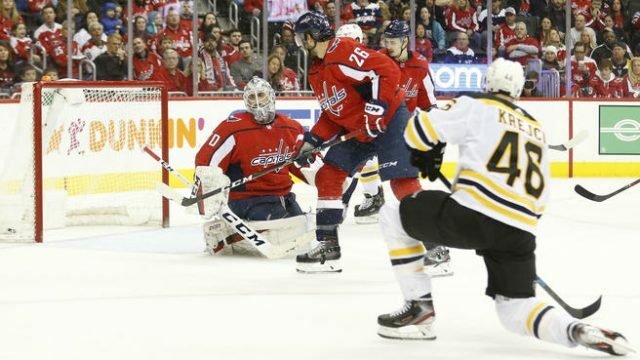 In the first of three games in another successful Boston sports Super Bowl Sunday, the Boston Bruins ended their 14-game losing skid against the Washington Capitals. Boston’s last win against the Caps came in March 2014. Tuukka Rask was the Bruin starter in Washington. Before Sunday’s game, Rask was 1-11-5 with a 3.30 GAA and .883 save percentage against the Caps. His only career win was a shutout at TD Garden. It was fitting that his second career win against the Caps and his first career victory in Washington came as a shutout too. The Bruins came in losers of five of their last seven. This horrid stretch started with a 2-4 loss against the Capitals back at TD Garden ending what was at the time a five-game Bruins winning streak. However, the Bruins looked very determined to finish their recent woes, both generally and versus the Capitals as well. They played a very good game but faced an old well-known foe in Braden Holtby. Midway through the second period, David Pastrnak found Torey Krug, who set up David Krejci beautifully for a goal to make it 1-0. Boston outshot the Caps 27-9 through two periods, yet they couldn’t get a bigger advantage on the scoreboard. In the third frame, it was all about Tuukka Rask eyeing his historic win. Rask achieved the milestone by beating the Capitals for just the second time in his career and recording his 253rd career victory. Rask became the most winningest goaltender in the Boston Bruins history, surpassing Cecil “Tiny” Thompson. He also collected his second shutout of the season and 43rd clean sheet of his career. As stated above, all that could not have come in a more iconic place than Washington. Rask has never won in that arena before, the Bruins got embarrassed playing on Opening Night in October earlier this season when Rask was pulled after allowing five goals on 19 shots on goal. Overcoming his early-season struggles, Rask has been stellar over the past couple of months. The concussion suffered in a loss against the New York Rangers right before the bye week spread fear among the Bruins fans, but Rask has looked sharp since his return. In his first game back from head injury, the Finnish netminder made 39 saves on 42 shots on goal by the Philadelphia Flyers. It wasn’t good enough as Philly took a 3-2 overtime win. But Rask really looked as though the concussion didn’t affect him at all. With the win against the Capitals, he just reassured everyone that he is eager and ready to play and looks to be suffering no ill effects. Now as the Bruins showed that they can finally get over the hump against Washington, and Tuukka Rask demonstrated that he can win big games for the Bruins, it’s the time for Boston to improve its offensive production. Because even if the win in Washington was great, The B’s are not going to win each night with a 1-0 score.